Staff and owners are very friendly & helpful. we reserved, as in summer time Kelowna really fills up. The location is out of town a lttle up the hill across the airport. All paved roads to get there in the RV Park all roads are on gravel as are the sites in the park. the setup is nice 5 sites on one side 5 sites across all backin. And big enough for big rigs the sites are separated by bushes giving you some privacy and are fairly level, you might need a board under one wheel maybe. 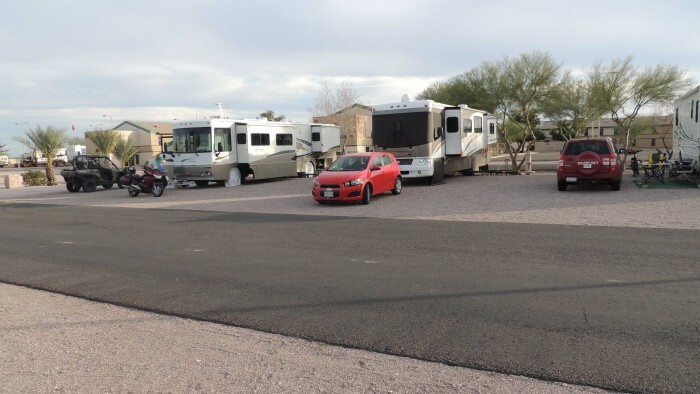 Some Longtimers but not disturbing all RV's were in top shape., sites are long and wide for big rigs huge compared to other parks,all on gravel Hookups, water, power, sewer, cable TV,via a receiver you get upon checkin. WiFi all working fine. Restroom and a shower, however I never used it .Setup is in the middle of Orchards no sport activities available like pickle ball, tennis shuffleboard, etc. the price is the same as any other orchard RV Park.in the area.we already returned again and did again enjoy it. r. We camped at Orchard Valley RV Park in a Motorhome. Staff is friendly & helpful. Without a reservation and no problems I got a site beginning of February. The place was pretty empty at that time. The location is out of town but close to the Interstate for easy access. No noticeable noise from highway. The roads are paved and the setup is nice. However, there are no trees, only green spaces between the sites. This is a park for a one night stay on the way south or north, so no RV's in disrepair. The paved sites are mostly pull-through with some backup-in and big enough for big rigs. Hookups like water, power, sewer were working fine. I didn't use the WiFi so can't tell anything about it. The restrooms were clean but there was nobody there to use them so no wonder. The shuttle bus to the Casino, bar and restaurant is a nice feature. 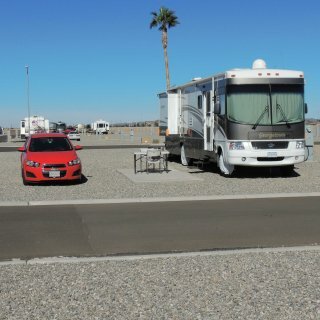 We camped at Wildhorse Resort and Casino RV Park in a Motorhome. Staff is friendly & helpful. I didn't reserve and end of January got a site right away. The location is on Boulder Blvd. South and therefore a bit off the action. No disturbing noise from the Blvd. though. The roads are paved and the setup is unique as the sites form a half circle. There are trees and some green spaces. I didn'see any Longtimers or RV's in disrepair. The gravel sites are a bit tight and ours was a drive in. The hookups, water, power, sewer and cable worked fine and I was able to pick up a good WiFi signal from the laundry building. The restroom was o.k. and clean, however I didn't use it. It's walking distance to the Casino or bar and restaurant. We would come back if in the area, but for a longer stay would prefer a park in North Las Vegas with hardwired Internet and better public connections to the Strip and Fremont. We camped at Las Vegas KOA at Sam's Town in a Motorhome. Staff is very friendly & helpful. I didn't reserve and got a site right away in mid December. But be aware, later in the afternoon and weekends the office is closed and there is no way to get in contact with somebody. The location is way out in the desert and there is pretty much nothing around. If you are 4-wheeling, this is a good spot. It's about 50 miles to Phoenix or 30 to Buckeye for shopping. Noise from the Interstate is very muffled and far away. The roads are paved and the setup is nice. There are some trees and palm trees but no green spaces. Longtimers and daily guests are in different locations. However I haven't seen any RV's in disrepair. The gravel sites are large enough for big rigs¸ hookups, with water, power, sewer, cable TV were working fine, we were able to pick up the WiFi signal from the computer room, but it was very slow, so I ordered the external solution, which wasn't better at all! As the park has grown over time, the restrooms, the laundry and the pool might be far away, depending where you are parked. Sometimes, depending on the wind, you can get a bad smell from a nearby chicken farm. There is a pool, a woodworking shop, a computer room and a rec. hall. All is in good repair but shows the age a little bit. We would come back for a shorter term. 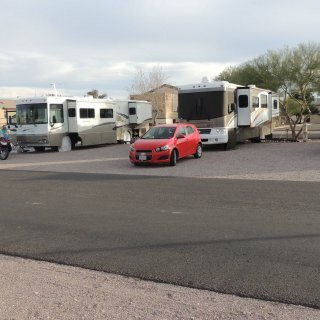 We camped at Saddle Mountain RV Park in a Motorhome. Staff is very friendly & helpful. Mid November I got earlybird price of 550.00 a month. It's out of town , 1.5 miles away from a Walmart. No noise from hwy nor airport except a few military jets. The roads are paved and the setup is nice. However, there are almost no trees and no greenery, a few park models are there. The gravel sites are huge. It gives the whole park an "open" feeling. Especially as there are no "longtimers" with their usual porch and mess. It's the usual setup with space for the RV, concrete pad and space for the towing/towed vehicle. The Hookups are standard with water, power, sewer and cable TV, no hardwired internet ( too bad for a brand new setup). The WiFi worked for us as we could pickup the signal from the computer room. For the rest of the park, bring your own solution. The Restrooms are all in tiles up to the ceiling, very nice, beautiful and clean. My negative point: The shower is separated from the "dressing room" by a curtain and the "dressing room" is separated by a curtain from the whole rest. Unfortunately, the curtains don't reach the floor and there is no step between shower and "dressing room", therefore, the whole floor is always wet. There are only two very small hooks, while the size of the shower is ok, the "dressing room" is too small. Getting into your pants is a challenge to keep them off the wet floor and not stuffing the curtain into it at the same time. Amenities like small pool and only 4' deep, hottub, tennis, pickleball, bowling alley, mini golf, etc. We camped at Carefree Village Resort in a Motorhome. After phone calls but without reservation we drove in looking for a site for a month. Friendly staff in the office, typical setup for an older Park in Yuma with paved roads. Each site is on gravel and level. It has a concrete pad for your table, chairs and barbecue, the site was just about long enough for our 36' RV and a bit narrow but slide outs and awning were still on our site, dated hookups with 50 amp power only and water with enough pressure and sewer. The hookups are at the very end of the site, so depending where your sewer outlet is, bring a long hose. WiFi was there but be very patient, even just for emails! Or bring your own solution. I didn't try satellite but it has to work as there are only a few palm trees spread through the park. Washrooms are in an older style but clean. Plenty of older style RV's give it not the best look. You can order cable, WiFi and phone through a communication company, which I would have done if we would have stayed. After two nights (our trial period) we moved to another Park. I think it is too much money for what is offered. Even $490.00 for the month of December seems too high for what it is. 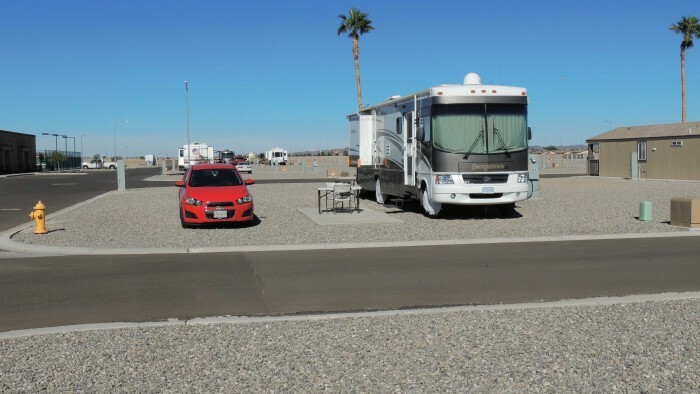 We camped at Desert Holiday RV Park in a Motorhome. After two nights we paid for another two. Friendly ranger in the office, typical setup for a State Park with paved roads giving you plenty of space to maneuver. Each site is paved, long and wide enough for big rigs with slideouts and awning, slightly sloping forward, the usual hookups with 50 amp power and water with enough pressure, nothing else, there is a dump station, I didn't try satellite but it seems to work as others had their dishes up. A few smaller trees spread throughout the park which is all gravel between sites an roads . A perfect view over the lake with beautiful sunsets. Washrooms are in painted concrete and clean, but there weren't many guests at this time. Close to town. We would stay again at this park when driving through but might as well try another one. We camped at Lake Havasu State Park in a Motorhome. Price reflects monthly rate of $450.00 + tax = 504.00) I made no reservation, simply drove in beginning of November and stayed a month. Friendly staff. The usual setup in North Las Vegas with a few small trees and close to bus station to go into town. Gravel driveways, level pull through and back in sites on gravel, long enough but a bit narrow, however enough for awning and slideouts, standard hookups with 50 amp power only at our site, water, sewer, cable TV, WiFi and hardwired Internet(! ), the WiFi cut out only few times during the month but I was hardwired with my main computer and was happy, cable TV with lots of channels, plenty of them double, I didn't try satellite but it might work on most of the sites. Enough sites for big rigs. There is a pool with really warm water. Washrooms and Laundry with toploaders + 2 Frontloaders were clean and looked good even though the cedar paneling makes it dark inside and you really need the lights. Some longtimers didn't disturb the overall picture. You have to get used to starting F-15's and F-16's from Nellis Air Force Base just a bit north of the Park, but they don't fly on weekends and on the other days it's not really that bad. Additionally, in the background, you always hear the sirens of police cars and ambulances as the North Las Vegas Police station is only 3 miles south of the park. On weekends you hear the muffled engine noise from the race track in the far distance. We will stay again at this park. The WiFi and hardwired Internet is definitely a big plus compared to other parks. We camped at Hitchin' Post RV Park & Motel in a Motorhome. Friendly and helpful staff. Gravel driveways, sloping sites to the front and right, all on grass, long enough but some are a bit narrow, pull throughs, water with enough pressure, 30 amp power, uphill sewer, no cable TV, no WiFi. No cell phone signal. Nice setup but could be a bit better groomed (why allow carpets on grass?) Our site had a large square patch of "absolutely no grass at all, about the size of the motorhome. I didn't try the satellite but it should work on some sites. Hookups are working but could use an update. Washrooms are just about o.k. but need more cleaning throughout the day (it's summer time and plenty of guests are there). Showers are coin op with enough hooks, no shelves and with old fashioned "barn doors". This is not really a resort but an o.k. overnighter. We camped at Three Island Resort in a Motorhome. I made a short term reservation for the August long weekend and got in! Friendly and helpful staff. Nice setup and layout along a creek with plenty of trees. Gravel and narrow driveways, pull through and back in sites on gravel, dirt and grass, long enough but very narrow, we couldn't open the awning due to trees, fairly level, 30 amp power, water, sewer and WiFi, which worked most of the time, no cable TV, I didn't try satellite but it might work on plenty of sites. Sites for big rigs available but watch out or better have your spouse outside watching all the trees and branches. There is a pool but on the long weekend with all of North America travelling and staying somewhere it was simply not inviting. With that many people staying the wasrooms should have been cleaned more often. Some longtimers at the back end of the park and some parked RV's in questionable state of repair were detrimend to the overal good looks. We will stay again but preferably not on a long weekend. We camped at Brookside Campsite in a Motorhome. Gravel driveways, not so level sites all on gravel and dirt, long enough but some are really narrow, we didn't fit on the assigned site and had to change, 10 pull throughs, water with enough pressure, 30 amp power, sewer, no cable TV, WiFi by a separate company, I didn't pay and didn't use ($5/day). Nice setup but not very well groomed along the shores of Sheridan Lake and also among trees, I didn't try the satellite but it should work on some sites. Hookups are dated but working. Washrooms need a MAJOR update. Showers are coin op but too small, not enough hooks, no shelve, no door, just curtains. Setup goes back several dozens of years! Laundry has toploaders only. Staff is very friendly and very helpful. If you are a fisherman and are not asking for much more, this is for you. I might try another Park if again in the area. We camped at Loon Bay Resort in a Motorhome. New owners are in their 2nd year, are very friendly, helpful and enjoyable. All gravel driveways or packed dirt, fairly level sites all on gravel or dirt or grass, different lenghts, some are a bit narrow. Water is supplied by garden hoses, 15 amp power supplied by several lenghts of extension cords, so not much power went through, the computer shut down each time the coffee maker was started. No cable TV. WiFi in or outside the office only but free and running o.k. There are a few log cabins for rent too. It's really a very nice setup along the shores of Fawn Lake and also among trees. I didn't try the satellite but it should work on some sites. Hookups really need to be updated. Washrooms were recently updated and are nicely tiled with wooden trims. Showers are coin op and working fine, there are enough hooks and shelves. This is a typical fishing resort with only electric motorboats and canoes and kayaks on the lake, it is pristine, peaceful and very relaxing! If you can be without the major hookups and want to relax, come here! With standard hookups I would have given a 10. We camped at Fawn Lake Resort in a Motorhome. New owners have taken over in Spring 2015. Gravel driveways, absolute level sites on gravel with grass around, water with enough pressure. 30/50 amp power at every site, sewer, cable TV, Wi-Fi, and wired internet very well working, all in a nice and modern pedestal. Nice setup among trees. Some sites are closer together and some are wider, some pull-throughs as well. Washrooms are the best you will ever find! Laundry has front loaders. The setup is along the highway, so depending where you are coming from, you might hear some trucks going by. New owners are very friendly and helpful and are trying to continue and maintain the property as it was. I will come back. We camped at ViewPoint RV Park & Cottages in a Motorhome.